Installing new gutters will help protect your roof and make your home look great. Do you have clogged, leaky, or damaged gutters? Gutter problems can be a real disaster, and water damage from poor gutters can cause expensive and unsightly damage to the interior and exterior of your property. Save yourself hours of frustration by calling the gutter professionals at Middle Creek Roofing. Everything roofing is our business, including gutters, and we take pride in a job well done. Middle Creek Roofing uses the best quality products and our works is done by the best professionals in the field. Has weather caused gutter damage to or completely torn down your gutters? Whether you need new gutters, or looking to fix existing, damaged gutters, Middle Creek Roofing can help. We will work closely with you to get the job done efficiently and quickly, removing any and all mess that may be left behind. If you're interested in gutter repair or gutter installation services for your home, call us today at 1-717-210-5980 or click below to get started. 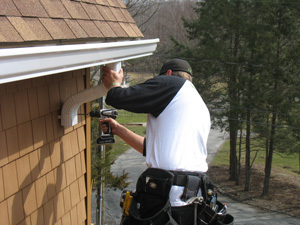 We offer gutter installation cost estimates in Allentown, Reading, Bethlehem, and throughout the surrounding areas. Middle Creek recently installed a new roof on this 2-story colonial home that has an older style gutter system currently. To achieve longer life out of the gutter system we installed a custom made copper flashing material and lined the existing gutters with it. Middle Creek Roofing offers gutters in these following colors to match the exterior of your home. Get a gutter cost estimate today! If you need gutter repair or installation, gutter guards, or any other gutter services, the local experts at Middle Creek Roofing have you covered. We can help you get the right solutions for your home and ensure that your home is completely protected from weather and water damage. Call us today at 1-717-210-5980 or contact us online to get started with a gutter repair or installation cost estimate. We offer all our gutter services in Reading, Allentown, Bethlehem, Newmanstown, Lebanon, Chester Springs, Lancaster, Levittown, Haverford, Wayne, and throughout the surrounding areas.